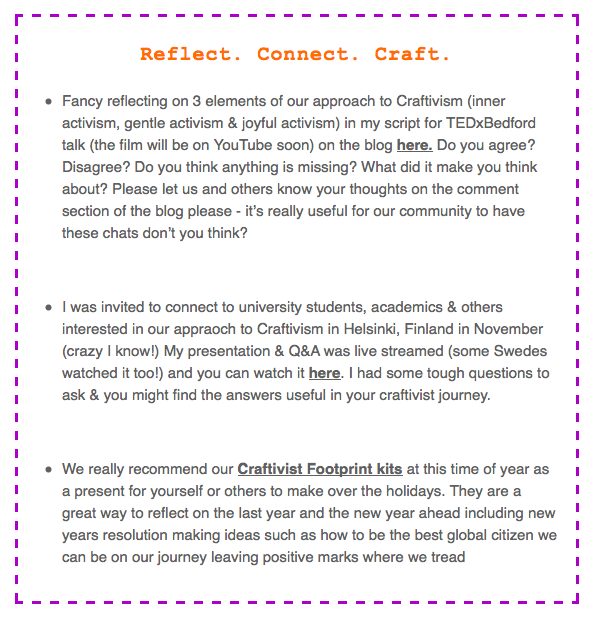 Here is our December newsletter, received by craftivists around the world. If you want the January issue in your inbox, sign up on the right-hand side of this page. Ok so I admit it, I was tempted by all of those ‘Black Friday’ bargains last week (who wasn’t!?). I’ve never seen such discounts in newsletters from companies sitting in my inbox & shops tempting me in. I admit that shopping can make me happy, there are so many beautiful things in the world I could buy(!) & I know it only brings short-term happiness and is a guilty pleasure but I can always find an excuse why I NEED that thing. However…. I also can’t and don’t want to ignore that part of me that niggles away, reminding me that this way of life isn’t sustainable and sometimes it can be harmful to people & planet. 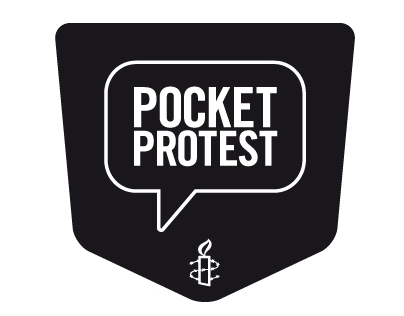 Activism tool: Be an Amnesty International’s Pocket Protester. It is easy to join and has real impact. Its a little text one in a while (not too often). I use it a lot. 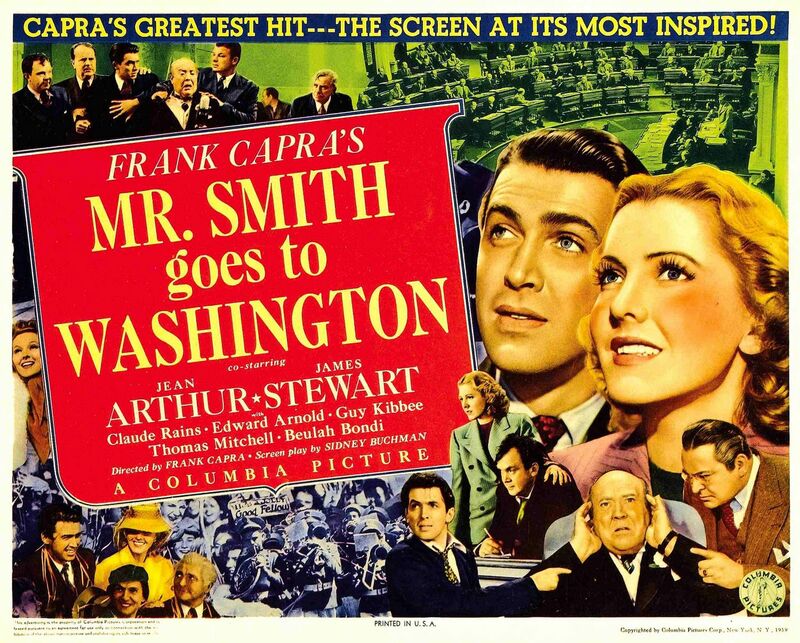 Perfect holiday film: Mr Smith Goes to Washington is a warmhearted film about a humble man standing up to his corrupt peers in politics. 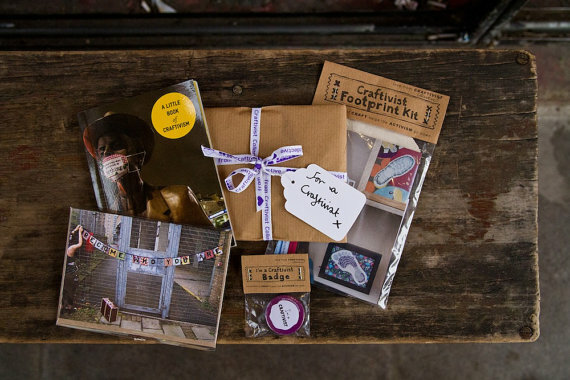 Why not ask for an Ethical Consumer subscription for Christmas? 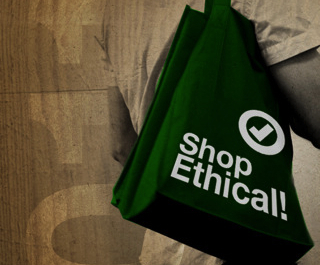 It’s super useful when we actually need to buy stuff & want to be as ethical as possible. 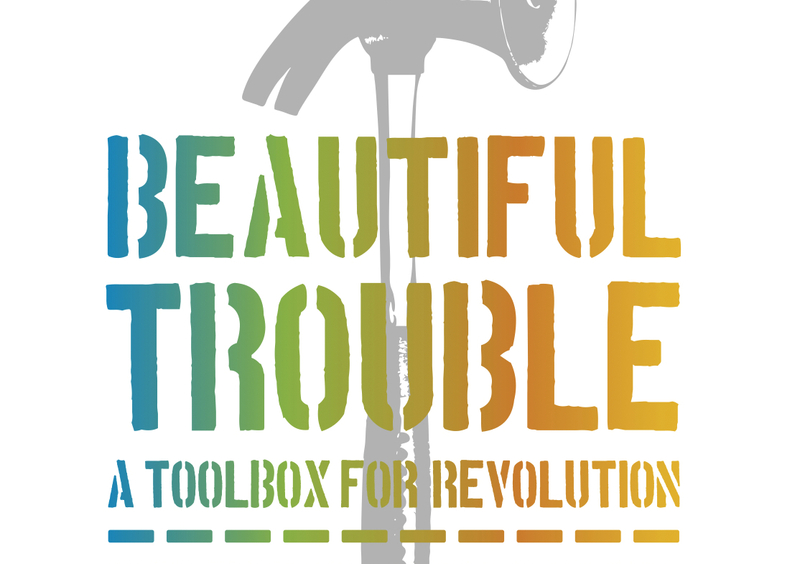 This is a very inspiring book: Beautiful Trouble. Showcasing social movements blurring the boundaries between artist and activist, hacker and dreamer. Whether you love Christmas or struggle with it, don’t forget to look after yourself and others over this holiday season. Such a lovely project to be invited into. We at WP group in Kent have got together for two sew, crochet and knit evenings. The banter was priceless and useful as well as supportive in many different ways. All agreed each evening had been creative and sustaining in skills and friendships old and new. Lots of reflections about, mothers,aunts and grannies nana’s who have passed their skills over the years.